www.Defender50th.co.uk :: View topic - After market elec window kits. After market elec window kits. Posted: Sun Nov 16, 2008 5:27 pm Post subject: After market elec window kits. I cant remember if i have asked before.But can anyone recommend a good quality after market kit.I'm fed up now with having to keep leaning over to wind the window down. I've got the Falcon4x4 ones on mine - these are actually SPAL ones try www.sempal.co.uk - I spoke to a guy there (sorry can't remember his name) who was very helpful - Falcon bought their gear from him till they ceased trading. Failing that try Maplins - cheap and cheerful !! Can you post some pics up Simon?. The motor brackets will need adjusting for optimum window movement. The grey foam pads acts as dampers. As a note you will notice the panel has been down to accommodate the CDL actuator. IMO the later ones are much improved, with thicker steel window frames which don't 'flap' about on the motorway, making them quieter and more draught/waterproof. Suppose you've still got to factor in spraying, so unless you were planning this anyway it would be too £££. Is the motor actually located on the back of the winder spindle??. The motor drive is on the left of the photo and the grey drive lines go to a drive cog which locates onto the spindle of the original winder ( right hand of photo) - to operate the drive lines have to be in a figure 8 - why I have no idea ! 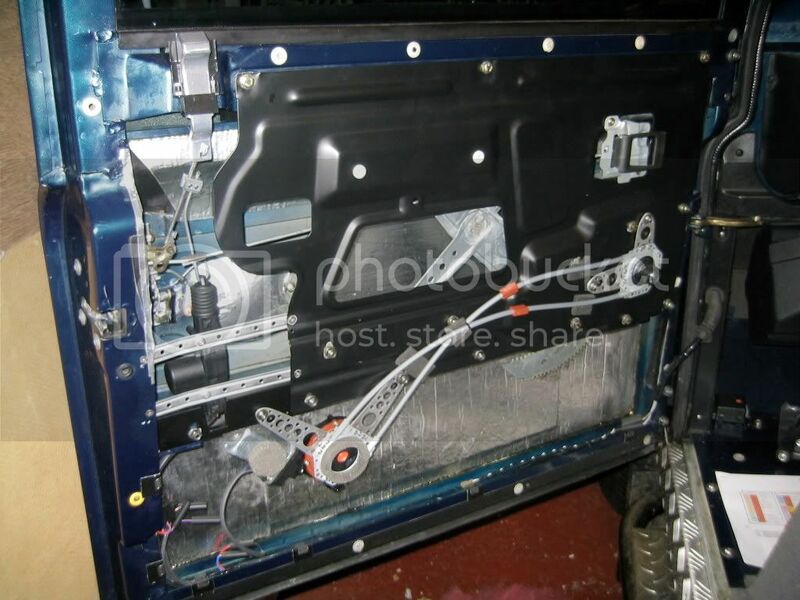 Simon.Whats the motor bolted to?.As from looking at the pic,it looks like its flush with the door skin?. Here is aphoto with some notes on it - along with more details below. Essentially the motor is suspended off the inner door skin (black metal bit) with M6 (maybe M4) machine screws. The window passes between the motor and the outer door skin. The rear off the motor has foam on it along with he rear. The front foam stops the motor scratching the glass. The rear foam and the foam on the motor (circular) compresses on the inner door skin. All the brackets foam and self tappers come with the Spal kit - you have to cut the brackets etc to fit. As I said its very tight in there ! Folks have suggested using Td5 doors - the only problem with this is you loose the door speakers I believe. Thanks for the detailed pics and info Simon.Copied and printed off.Will help when i fit mine.